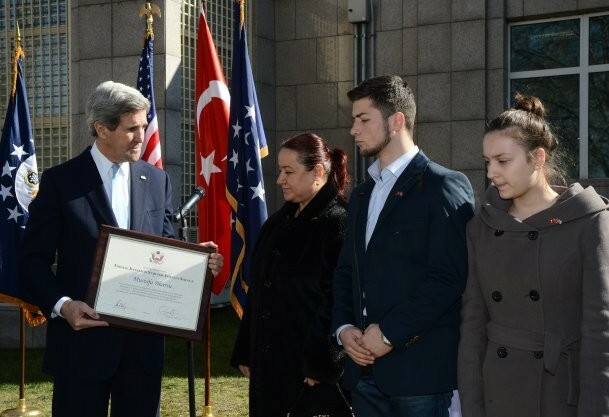 US Ambassador in Ankara, Francis Ricciardone, embassy staff and the family of Akarsu were present at the ceremony. Kerry said, "On behalf of the people of the US, I bring you condolences of President Barack Obama, everybody in the congress, the administration and all of the American people. I offer my deepest condolences to Yasemin, Sami and Hilal and to the Akarsu family. All of us still mourn Mustafa's sudden loss." Furthermore, Kerry expressed, "Mustafa laid down his life for all of us. Guarded these gates for more than 20 years. He did not just stand guard, he stood tall. When the menace of terrorism came to these gates, Mustafa did not hesitate for a moment. He and his fellow guards acted heroically saving lives with quickness and bravery. I am particulary reminded that on the day Mustafa gave his life for this embassy, that was my first day as secretary of state. When I raised my hand to take the oath of the office, the tragedy was immediately was on my mind and in my heart." Kerry continued as saying, "Your colleague Mustafa, I am told was a dreamer. As much as he loved his job and his life here in Ankara, he never stopped thinking about the future. He wanted to give his children the opportunity to earn an education in the US. Mustafa was so keen on this plan that I am told that his friends gave him a nickname in Turkish "Yari Amerikali" (half American). And today it is our duty to complete these dreams for him." US State Department earlier said that Kerry will meet with Turkish officials to discuss US's strategic priorities –from ending the crisis in Syria to promoting regional stability, peace, and security– as well as explore areas to deepen US-Turkey bilateral cooperation, including counter-terrorism cooperation. Alongside Syria issue, a broad agenda will be on the table. Bilateral commercial, economic and political cooperation as well as the latest developments in Afghanistan, Balkans and Cyprus will be discussed. Kerry, who had visited England, Germany, France and Italy prior to Turkey, will head to Egypt, Saudi Arabia, UAE and Qatar respectively after completing his talks in Turkey.